Thailand is the perfect Southeast Asian destination for a family holiday. 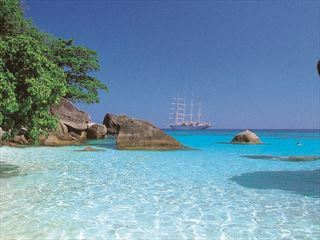 Picture white-sand beaches lapped by turquoise waters, temple-studded cities, crashing waterfalls and jungles. You’ll experience all this and more on our 11-night tour of the Land of Smiles. The adventure starts in Bangkok and continues to the riverside town of Kanchanaburi. You’ll visit Chiang Mai and its surrounding mountains, temple ruins in Ayutthaya and end the trip on the idyllic beaches in Hua Hin. 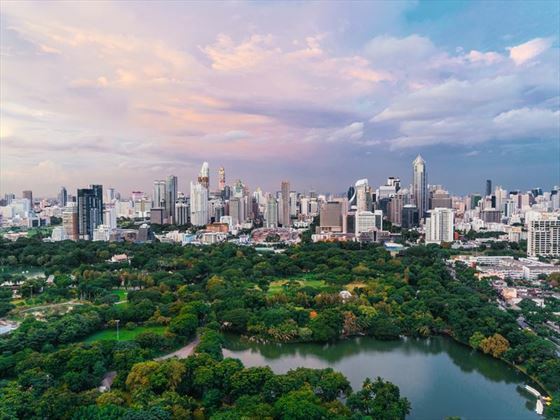 Highlights include a chance to ethically interact with elephants at the acclaimed Elephant Nature Park, touring the ruins of Ayutthaya, staying with locals in a jungle village and splashing around in the waterfalls at Erawan National Park. 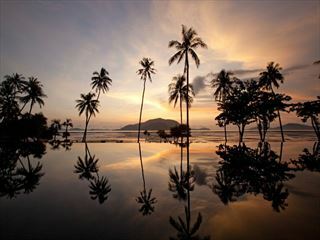 You’ll also have time to relax on the soft-sand beaches of Hua Hin and experience traditional overnight sleeper trains. This trip is ideal for families of all ages who love adventure, nature and exploring new cultures (INT). Meet, feed and bathe rescued elephants at the Elephant Nature Park. Take a long-tail boat on the canals and visit golden temples in Bangkok. Splash around in spectacular waterfalls at Erawan National Park. 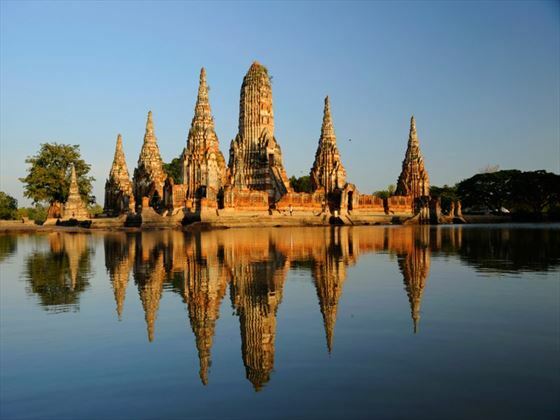 Visit ancient ruins in UNESCO-listed Ayutthaya. Stay in a traditional hillside village in the mountains. Explore mountain-top temples and visit an umbrella factory in Chiang Mai. Travel with the locals on an overnight sleeper train. 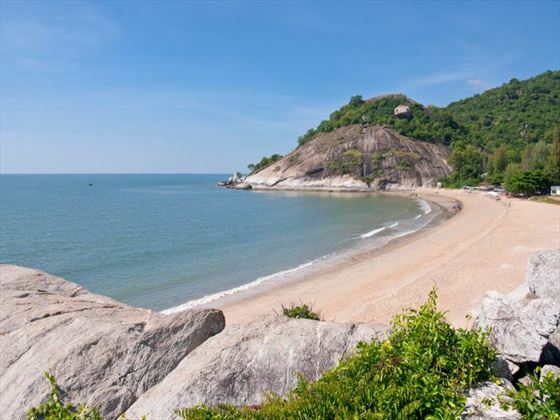 Enjoy some sun, sea and picture-postcard beaches in Hua Hin. Welcome to the Land of Smiles! Start your adventure with a 6pm welcome meeting at the hotel. If you arrive early, start exploring Thailand’s crazy capital, which is filled with colourful tuk tuks, enticing street food, bustling markets and glittering temples as well as glassy mega-malls. You could take a riverboat to Chinatown, visit the Grand Palace or experience Khao San Road, which is perhaps the world’s most famous backpacker street. 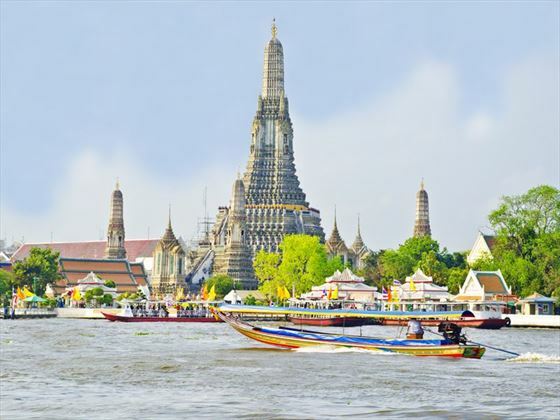 Start the day with an hour-long boat trip on Bangkok’s Chao Phraya River, which is lined with grand buildings and temples, and explore the khlongs (canals). You’ll visit Wat Pho, which is one of Thailand’s most sacred temples and home to its largest reclining Buddha, which is a staggering 46 metres long. Wander around the temple grounds, which are known for Thai medicine and massage before taking a local bus to Kanchanaburi. 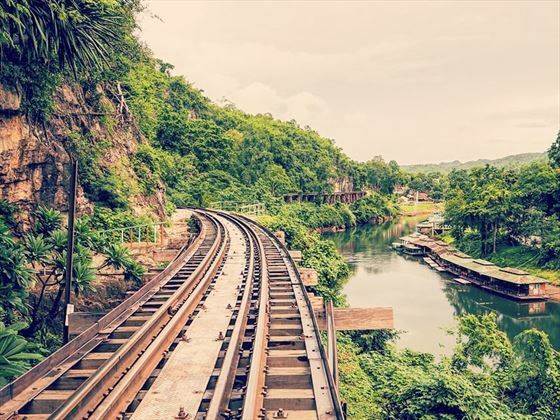 It takes about two hours to reach this countryside town, which lies on the Khwae Noi and Khwae Yai rivers and is home to the infamous WWII Bridge over the River Kwai. Today you’ll travel 90 minutes to Erawan National Park, taking in the lush countryside scenery along the way. The park is located in the Tenasserim Hills and has a nine-tiered waterfall, Erawan Falls. Cool off in the topaz pools filled with tropical fish, relax with a picnic and watch out for wildlife such as eagles and cheeky macaques. On the way back, you can opt to take an additional kayaking trip down the River Kwai and paddle underneath the bridge itself. Other activities include visiting nearby Buddhist temples or war museums. Travel two and a half hours by minibus to the former capital of Siam, Ayutthaya. Enjoy a guided tour of the UNESCO World Heritage ruins and temples, which date back to the 14th century. Highlights include the ruins of Wat Phar Mahathat and a Buddha head statue that’s entwined in the roots of a Banyan tree. Next, you’ll board the 11-hour overnight sleeper train to the northern city of Chiang Mai. The journey is an adventure in itself as you’ll travel alongside locals in soft sleeper class. Multi-share compartments feature seats that convert into bunks, complete with bedding, air conditioning and a food and drink service. Bring snacks and warm clothes, as the air conditioning can be strong. Wake up in Thailand’s northern capital of culture, Chiang Mai. This leafy city has a walled old town surrounded by a moat and is dotted with 300 temples frequented by iconic orange-robed monks. Take a trip to one of the most impressive, Doi Suthep Temple, which sits atop Suthep Mountain and offers panoramic views of the city. Climb the staircase, guarded by statues of dragon-like creatures called nagas, to the golden temple at the top. Later, you’ll visit the Bor Sang umbrella factory, where you’ll learn about how these local products are made. There will be free time to explore Chiang Mai and perhaps take an optional bike tour or cooking class. In the evening, shop at the local Night Bazaar, which features hundreds of stalls selling everything from clothes and souveniers to street food snacks. You can choose to end the day with a Thai massage or meal by the riverfront. Set off at around 8am to visit the Elephant Nature Park, which is located in the stunning Mae Taeng Valley, about 90 minutes from Chiang Mai. The park is renowned as a rescue centre and sanctuary for abused elephants. An expert guide will help you learn about the problems facing these gentle creatures in Southeast Asia and you’ll get the chance to watch and feed the elephants from a viewing platform. After lunch, get your swimmers on and bathe the elephants in the river, a truly magical experience. Spend the night 45 minutes away in the village of Ban Hua Tung, set in unspoilt jungle scenery. The community will invite you in for an evening of fun, which includes a home-cooked dinner and an authentic Thai dance performance. Note that days five and six of the tour may be shuffled around according to the availability of your host family. Say goodbye to your hosts and join a local guide for a trip into the forest, which is protected by Buddhist monks and the local Hua Tung people as part of a community initiative. 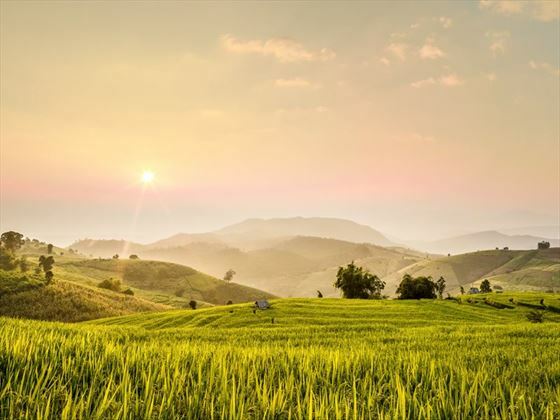 You’ll get views of towering Chiang Dao Mountain and learn about the area’s biodiversity, the yearly bamboo harvest and herbal medicine. Return to Chiang Mai after your jungle adventure for some relaxation. 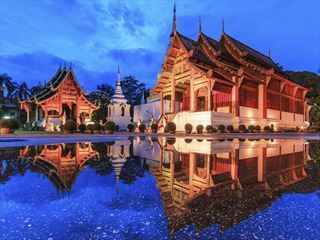 Enjoy some free time in Chiang Mai, perhaps with a cycle tour, massage or temple hopping excursion around the city. Optional activities include visiting the Butterfly Garden and Insectarium or the unique Northern Thai Doll Museum at Baan Tawai handicraft village, where the dolls are dressed in ethnic costumes. At 4pm, you’ll take the overnight train south for some beach time. After your train journey, head three hours by minivan to Hua Hin, a peaceful beach town that was once a traditional Thai fishing village. The area was made famous once Thai royalty started holidaying there in the 1920s. Take some free time on the beaches, swim in the sea and explore the modern town. Hin Beach is the most popular spot, lined with restaurants where you can have a leisurely meal overlooking the water. You have the whole day to spend as you please. Simply chill out on the beach or take an optional activity such as a bike tour or hiking trip along the nearby mountain trails, you can even visit a vineyard. There’s plenty to do if you stay in Hua Hin, check out the fancy Victorian garden estates or visit the local night market, where you can buy street food and souveniers. Travel back to Bangkok by bus and spend the rest of the day exploring the capital. Do some shopping, visit some more temples or take a tuk tuk tour of the city. As an optional activity, you can visit Siam Ocean World, one of the largest aquariums in Southeast Asia, which boasts a wide array of marine life including eels and Striped Frogfish. Another option is the Art in Paradise museum, which features some quirky 3D exhibits. You’re free to depart the hotel at any time and there are no planned activities for the day. If you have some spare time, fit in some final temple visits, do some last-minute shopping on Khao San Road or have a massage before you wave goodbye to Thailand. Accommodation: eight nights in a hotel, two overnight sleeper trains and one homestay. Transport: bus, longtail boat, songthaew, overnight sleeper train. Food: 11 breakfasts, one lunch and one dinner. Activities: Bangkok boat tour and Wat Pho Temple, Erawan waterfalls and Erawan National Park near Kanchanaburi. Ayutthaya temple ruins guided tour, Chiang Mai Doi Suthep temple, umbrella factory and day trip to the Elephant Nature Park.